As a particular holiday is on the horizon, this week on the site I have decided to dedicate a number of posts to greeting cards. As you know, real mail is important to me. I love exchanging letters, postcards and mail art with friends. Though Mother's Day and Christmas are the leaders in popular card holidays, Valentine's Day holds steady at third (occasionally edging to number two depending on the year). This is not exactly a Valentine's Day post, but a way to elevate amazing illustrators and their work, which is available in card format. I hope you enjoy and will check back throughout the week. It is probably no surprise that many of the illustrators featured in this series are British. I am a fan of the British art scene (as seen with Lou Taylor, Kate Cardigan, etc). Today is no different. I am wrapping up this week's greeting card series with Sophie Corrigan, a freelance illustrator in the UK. You probably have seen her work without knowing her name. Her client list is pretty impressive: Tesco Magazine, Hallmark Cards, Ohh Deer, Jellycat, Healthy Planet, Felt Studios, Digitas Health LifeBrands, Boomf and Mindapples. Or maybe you saw one of her delightful cards for sale at Paperchase, Urban Outfitters, Hot Topic, Topshop, SOMA Gallery or ASOS. That is how I stumbled across her work. She is a constant favorite in the Ohh Deer Instagram feed. The first of these, "Hedge-Hugs." I love word play and who does not "awe" over two Hedgehogs in a Hedge-hug? This led to looking at more of Sophie's cards and prints. Animals are her primary subject and her treatment of each animal is whimsical and charming. She also throws in humor, which you can see in the collection curated below. This collection is just a sampling of Sophie Corrigan's amazing work. 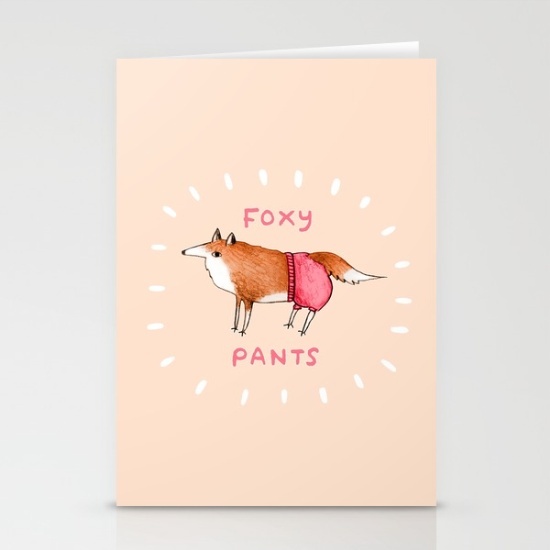 I highly encourage you to check more of her work either on her site (linked above), Ohh Deer, Society6, or her Etsy shop (to name a few - for a full listing see her website).